Contact: How do I contact someone from your company? Orders: How do I place an order for your products? Orders: What is your lead-time on Orders? Lead time for orders will be displayed at checkout. This time fluctuates throughout the year. As we approach the holiday season, a cutoff date will be announced for “Guaranteed by Christmas”. Once you have completed payment for your order you will be assigned an order number which will appear on the payment confirmation screen. You will also receive an email confirming your order. If you did not receive this email please check your junk mail folder. You may cancel your order up until the point that it has gone into production. Once your order goes into production it cannot be cancelled due to materials being cut and personalized for your order. To cancel an order contact me directly at julio@secondalarmcustomleather.com. Please include your order number. Refund will be made to original form of payment. Orders: Do you do large orders for entire departments or large groups? When a large order for a department or group is presented, a consultation will take place and depending on the amount of items ordered a discount will be offered. Orders: What are my payment options? We accept all major credit cards and you will be prompted to complete payment once you have completed your order form. Shipping: How will my order be shipped? All orders will be shipped Priority Mail or First Class Mail through the United States Postal Service. Most orders will have a shipping time of 2-3 days. When your order is finished you will receive an email to let you know your order is complete. You will also receive an email with tracking information for your package if it ships as Priority Mail. There is no tracking number for items shipped First Class Mail. Shipping: How much will I be charged for shipping? All items are shipped through the United States Postal Service and are charged flat rate shipping depending on the item. Shipping: Do you ship International? Warranty: Do your leather products come with a warranty? Warranties for products that are going to be used in firefighting are complex. Due to the extreme conditions and the general “rough” activity that is experienced while firefighting, warranty claims will be handled on a case-by-case basis. Things that will be considered when processing a claim are length of time the item has been in service, condition of the leather item when it is presented for a claim and general overall appearance. Hardware such as buckles and trigger snaps will carry a 1 year warranty. If it is determined that the defect will be covered under warranty, there will be no cost to you for the labor, parts or shipping. If it is determined that the product will not be covered under warranty, I will offer a reduced rate on labor and any product that needs to be used to fix your item. Please rest assured that I will be fair and your satisfaction is my number one priority. Product Care: How do I take care of my leather items? Taking care of your leather item is simple and necessary to gain the maximum amount of in-service time possible. Frequent and as needed cleaning and conditioning of your leather product can be done with several different products. I recommend using Fiebing’s Aussie Leather Conditioner and Fiebing’s Snow Proof. Both of these products are available on this website. 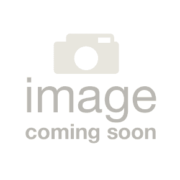 Another product that can be used is Lexol. You can be purchase Lexol at many big box or auto part stores. You will need the Lexol Leather Cleaner (orange spray bottle) and Leather Conditioner (brown spray bottle). There are many other products on the market but these are the ones I recommend. 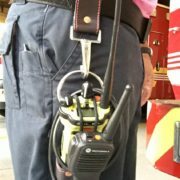 Charity & Group Sponsorship: Do you support charity and certain fire service related groups? 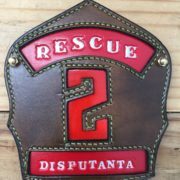 Second Alarm Custom Leather is a leather workshop specializing in handmade custom products for the fire service. 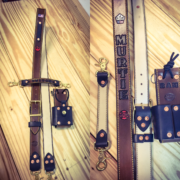 Our items include custom Leather Radio Belts, Suspenders, Truck / Axe Belts and Firefighting Helmet Shields/Fronts. All items are manufactured in house with the finest quality leathers and hardware on the market. 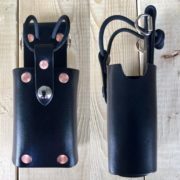 My leather products are custom fit for each individual. This give’s you a custom, clean and professional look. I can assure you my leather products will exceed your expectations and last for many years of service.